Rosenthal gazes at her winning results displayed on the TV of The Parlour. UPPER WEST SIDE — Councilmembers Helen Rosenthal and Mark Levine silenced their challengers Tuesday with resounding victories in the Democratic primary. According to the city’s Board of Elections, Rosenthal secured 13,060 votes, representing nearly 65 percent of District 6's registered Democrats who showed up to vote. The incumbent’s main challenger, Mel Wymore, received 6,280, a little more than 31 percent of the votes. BOE numbers show that more than 20,000 District 6 residents voted in the Democratic primary with 99 percent of scanners reporting as of Wednesday morning. 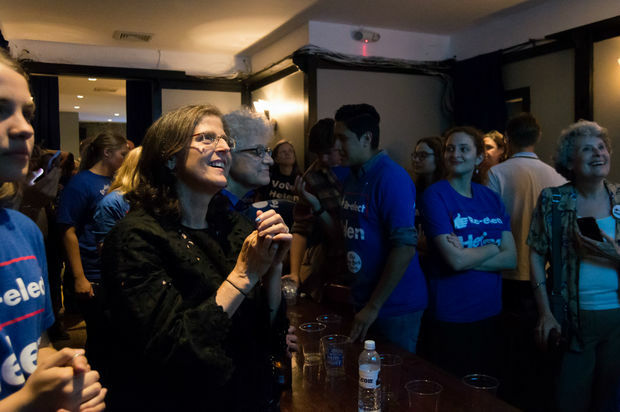 Rosenthal celebrated her victory with her staff and supporters donning blue "Re-elect Helen" T-shirts at The Parlour at 250 West 86th Street. The incumbent said plans to keep focusing on affordable housing in her second term. Rosenthal will face off against two independents and a Republican candidate in the Nov. 7 general election. Rosenthal’s Progressive Caucus colleague to the north also secured the lion’s share of his district’s votes. Mark Levine, the incumbent councilmember for District 7, garnered 8,839 votes, or close to 75 percent of the district, according to unofficial BOE numbers. His challenger, Thomas Lopez-Pierre, who ran a campaign against “greedy landlords,” received 25 percent of the vote at 3,001. Nearly 12,000 residents voted in the District 7 race, the BOE numbers show, with about 98 percent of the votes tallied.